While Georgia has yet to be officially declared an upper middle income country by the World Bank, as a result of the 2014 census, it’s likely to be labeled one after the final census results are published in April of 2016. Interestingly, Georgia likely became one in 2013. Why is this the case and what are the implications? Let’s take a look using the 2014 preliminary census data and a population model developed by Ilia State University’s Giorgi Tsuladze published in a 2014 United Nations Population Fund (UNPF) and International School of Economics at Tbilisi State University (ISET) report. In 2002, the Georgian government carried out a population census and found that there were 4.37 million Georgians. This number though was and is widely considered to be suspect. According to the 2014 UNPF report (and notably, Geostat employees at the time), the main problem with the 2002 census was its method of counting the migrant population. Specifically, the 2002 population count included 114,000 migrants who may have been permanently settled abroad rather than temporarily. This number may have been even higher considering that an estimated one million Georgians left the country between 1990 and 2002. Their family members who were interviewed for the census may have been reluctant to report that their relatives had gone abroad and instead reported them as temporary migrants or still in the country for a variety of reasons. Not only was the census off, but so too were the civil registries which count birth and death registration. Between censuses, governments update population counts based on birth and death registrations, but because many births in Georgia happened and to a certain extent still happen outside of hospitals, births are not always registered. Also important are the lack of death registrations. Recognizing these problems, Giorgi Tsuladze, a Professor at Ilia State University, made a downward adjustment of the population figure from the 2002 census, an upward adjustment to the birth rate, and a decrease in the estimate of the average life expectancy to estimate the population. In turn, his estimates of the population are quite close to what the preliminary 2014 census results tell us about the Georgian population – there are about 3.7 million people in Georgia (excluding South Ossetia and Abkhazia). Hakkert, Ralph, Gulnara Kadyrkulova, Nata Avaliani, Eduard Jongstra, Lasha Labadze, Maka Chitanava, and Nino Doghonadze. Population Situation Analysis (PSA) 2014. Rep. Tbilisi: United Nations Population Fund, 2015. Print. The second important part of this story is understanding how countries are classified into income groups. The World Bank classifies countries by Gross National Income per capita (slightly different than Gross Domestic Product per capita – see here for exact definitions). Countries with a per capita GNI of less than $1,045 are considered low income countries. 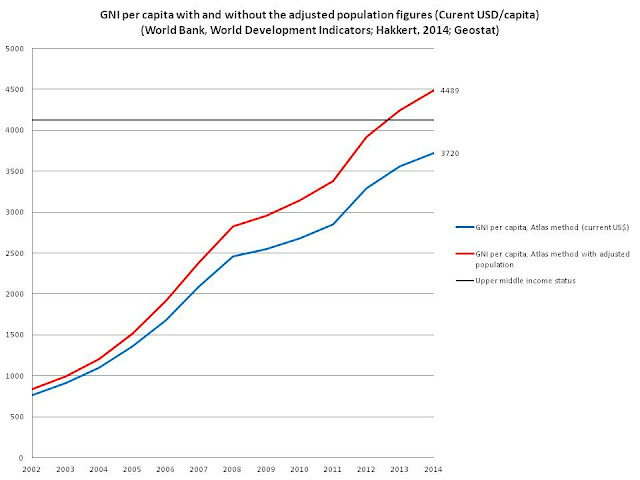 Countries with greater than $1045, but less than $4,125 GNI/capita are classified as lower-middle income countries. Countries below $12,736 but above $4,125 GNI/capita are considered upper middle income countries, and countries above the $12,736 mark are considered to be upper income countries. Since, a country’s income classification is based on the size of its population, and as we saw above, Georgia’s official population size was inflated by a fairly sizable margin for the past twelve years, Georgia’s GNI per capita (as well as GDP per capita) was underestimated. Georgia probably moved from the lower-middle income to the upper-middle income grouping in 2013 when GNI per capita moved from from $3914 in 2012 to $4240 in 2013 (based on Tsuladze’s population estimates). In 2014, using the preliminary census data, Georgia’s GNI was $4489/capita. Hence Georgia has very likely moved income groups, barring a major miscount of the preliminary census data of roughly 330,000 people. Well, it is good and bad news for Georgia. To start with the bad, aid is sometimes distributed based on a country’s economic status. There are many other important factors at play (see here for a discussion of the subject), but nonetheless it is often considered in aid decisions. Hence, Georgia may expect lower levels of aid in the coming years as its per capita economic statistics are adjusted upward following the finalization of the 2014 census in 2016. When it comes to the good news for the country, Georgians are doing better than the numbers suggested. This does not change the facts on the ground and widespread poverty experienced in Georgia, but in the long run it can lead to a number of benefits. For instance, foreign private capital flows may increase as the country may be perceived as a more enticing investment environment, having moved to a higher income category. The upward adjustment will also be important for Georgia’s Euro-Atlantic integration prospects. One of the key factors which the EU has identified as a barrier to prospective membership for countries in its neighborhood is low income levels, and as Georgia’s income level gradually increases, it will make Georgia a more attractive partner country. Notably, the lower population also means that per capita income is increasing at a higher rate than previously thought. In the short term, it may also help ease fears over migrant flight from Georgia (which is likely an inhibiting factor at present for Georgia in the EU visa liberalization process). It is important to note that if income inequality persists in Georgia, economic growth is unlikely to deter migrants from attempting to make their way to the EU, though a fuller treatment of this subject is beyond the scope of this post. On the grand scheme of things, the adjustment is good as well. While not necessarily good for Georgia, countries in more dire straits may receive more aid that would have been aimed at Georgia. Better decisions about what kind of aid the country receives may also result from the more accurate data and income categorization. Although we should not expect to see the official income categorization change to upper-middle until after Geostat has published the final census numbers and adjusted its population estimates for 2002-2014, it should occur in the next few years. To take a look through the preliminary 2014 census results, take a look here, and for the estimates of the population size which this blog is based on as well as other interesting data and analysis on Georgia’s demographic situation, take a look at the UNPF/ISET report, here. Notably, Georgia is not the first and surely not the last country to have a major economic indicator readjustment based on something besides economic growth. Ghana and Nigeria both have had large changes to their economic indicators in recent years caused by how GDP was calculated rather than growth with interesting implications. Listen to this Planet Money story to find out more.